Focusing on history, food and culture, RBTH hopes that you will enjoy regular updates from our “correspondents” and their inside stories about life in towns big and small, rural and urban, provincial and cosmopolitan. Surgut (2137 kilometers from Moscow) is one of Russia’s fastest growing cities and the largest population center in the oil-rich Khanty-Mansiisk Autonomous Area (the Khanty and Mansi are the two largest indigenous groups here). Several major natural resource companies are either headquartered here or have major representative offices including Surgutneftegas (with roughly 82,000 employees in the region) and Gazprom. My favorite place in my hometown was constructed not long ago in 2001. It's the historical and ethnographic center Stary Surgut (Old Surgut) located in the historical center of the city on the banks of the Saima River. There are about a dozen wooden houses – copies of real houses that were common to the city in the past and a wooden church built in the tradition of the Northern Russian Orthodox style. There are several exhibits devoted to the life and culture of local indigenous peoples – Khanty and Mansi and several clubs that unite long-term residents of Surgut and those fond of handicrafts. Members of handicraft groups offer workshops on embroidery, cooking and pottery. 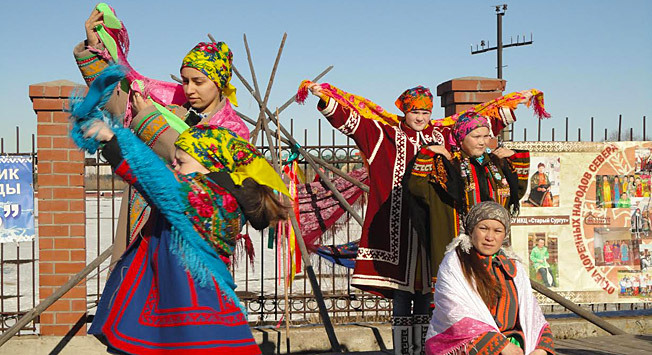 Old Surgut is a place to celebrate folk holidays including those celebrated by the Finno-Ugric peoples, and pagan feasts such as Crow Day (celebrated in April). There is also a regular festival of ethnic cultures in summer. In winter it is already a tradition to come here to see ice sculptures. In summer it is a nice place to walk around. You can see a reconstruction of the traditional living space of an indigenous family – a chum (a kind of a vigvam), a labaz (a storage for food) and a stove. The local history and culture museum. Among other things the museum has a very interesting collection, a so-called Kholmogorsky treasure – a collection of objects that belonged to people inhabiting the region in the 4th - 5th centuries. The collection features a series of metal figures of animals – birds, snakes, fishes, and of course bears – the sacred animal, the younger son of the primary god Num-Torum worshipped by the pagan Khanty people. More than 400 years ago the Russian Tsar's military came to Surgut to found a settlement. They fought and drove away the Khanty people who inhabited the region. The main purpose of the settlement at that time was to provide the nobility and the court with furs, which was at that time the biggest treasure of Siberia in the eyes of the boyars. But the city didn’t become much more than a village until the 1960s when it became a center for oil and gas production. Surgut has several good places to go skiing and it's an absolute must in winter. In summer go berry and mushroom picking in the taiga. And of course non-vegetarian visitors must try some reindeer meat that you can buy from the Khanty people in winter. And try the delicious fish from the Ob River: muksun, nelma and sterlyad. There is a lot of water around Surgut – numerous lakes where one can go fishing. The Ob River – one of the longest in Russia – is also good for fishing. Ruskinskaya village is a national settlement for the Khanty people. At the end of March Surgut residents head to Ruskinskaya to see a reindeer race. Fish is eaten in all possible ways here. Stroganina is a frozen row fish that must be eaten immediately with salt and pepper before it melts – this is the traditional Khanty way to eat raw fish. “Podavushka” is a fish soup usually cooked with pike or other river fish. Like in the rest of Siberia, pelmeni (dumplings) is beloved in my hometown – two or three kinds of meat are usually mixed in the pelmeni stuffing. Pelmeni with fish are also a local specialty. Manty – steamed huge pelmeni are also popular in Surgut. The gifts of the taiga are usual on a Siberian table as well - cedar seeds, mushrooms, cranberries, blueberries and lindenberries. Who are the well-known people from your city's history and why were they famous? Farman Salmanov is a geologist and a member of the Russian Academy of Sciences, who found oil in Western Siberia in 1961. The house of Salmanov in Surgut is now a museum. Not so long ago the sad story of the former secretary general of the Greek communist party and antifascist Nikos Zachariadis became known to the public. Zachariadis was sent to Surgut to live in exile in 1962 under a fake Russian name. He was not allowed to leave the town and committed suicide in his flat in 1973. However, some sources say he was murdered. His remains were transferred to Greece in 1991. What's your city's favorite holiday? How do they celebrate it? Surgut is the city of oil and gas workers, so their professional holidays are celebrated citywide and are probably the favorite holidays for city residents. They are celebrated outside usually with a concert on one of the city squares. Someone who works in the oil and gas industry, has a car or even two, and goes to the seaside in summer. Those who live and work in Surgut retire earlier due to the harsh climate they live in – women retire at 50 and men at 55. An ancient settlement was found in Barsova Gora, but excavations stopped because the place was sold to rich people for dacha settlements. If I could change something I would continue the excavations in that region. Another problem is too many cars – Surgut is in third place in Russia for cars per person. There are not enough parking spaces and drivers park on the sidewalks. I would certainly change that.